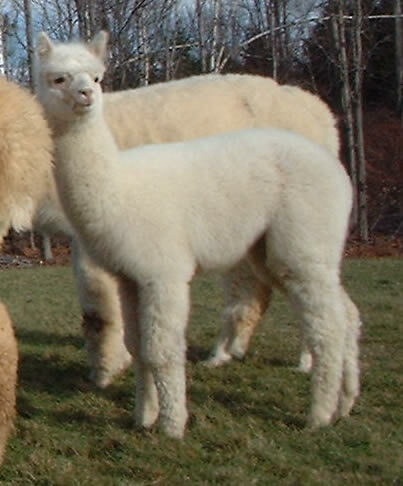 "America" is a white Peruvian and a proven mother. 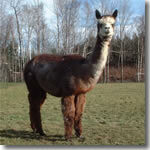 She has given us 3 outstanding crias and is due to have another in October of 2006. "Malta" is a very pretty, medium rose gray color. 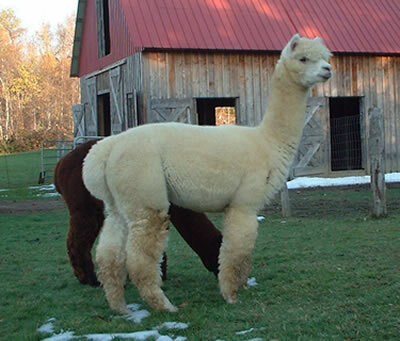 A proven mother with excellant lactation; she is a very attentive parent and has passed on her gentle personality, as well as her color, to her daughter,'Hallie'. "Haiti" is a beautiful true black with strong black genes in her heritage. She has proven to be a very good mother and has a very gentle nature about her. She is always a favorite with visitors because of her pig-tail ears. 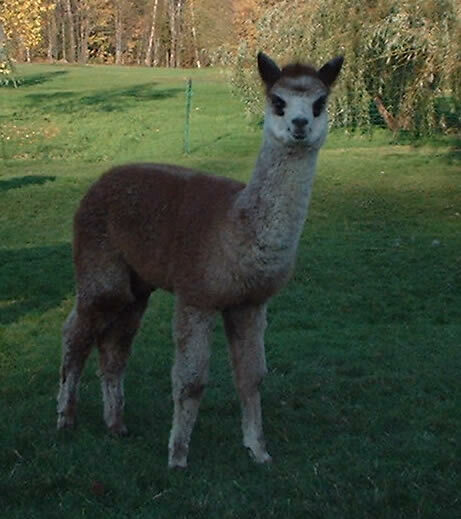 Due Date: Arrived June 24, 2006; "McGregor"
"Molly" has very nice crimpy fiber and a full fibered head as well. She has a very curious personality about her and is expected to be a successfull producer for years to come. 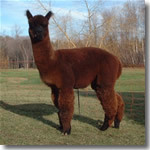 Both she and her brother, 'Mack', took a blue ribbon in the Product of Dam class at the Coastal Classic Show in Maine in 2005. 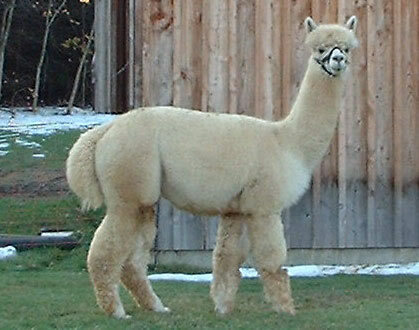 She will be bred for the first time May, 2006. 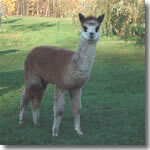 "Hallie" is without a doubt the prettiest cria we have had so far. She is a Light Rose Grey color with a very friendly personality. Using her in your breeding program would add color to any herd. 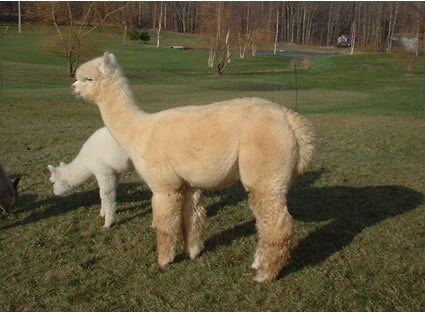 "Arilla" is a white Peruvian from an outstanding mother and father. She is also the grandaughter of Bueno, so she comes from terrific genes. She would make an excellant foundation female for any breeding program. 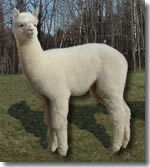 You can expect to see her in the show ring very soon! "Coronado" is a handsome light fawn color. He is the grandson of 'Royal Fawn' and the son of 'Dom Lucilio'; so we know his heritage is great and has the potential for siring show winning offspring. 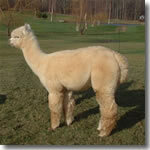 He is just beginning his breeding career but is already showing us that he has what it takes. 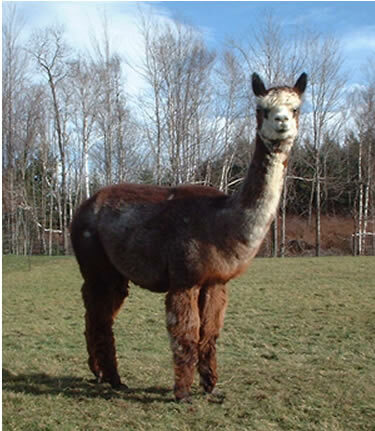 His first crias are due mid summer 2006. 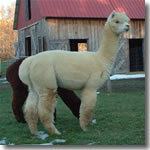 He is co-owned with Skyview Alpacas. 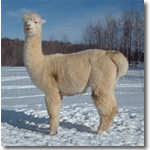 "Mack" is a handsom white male who is ready to start breeding. He has soft, crimpy, fiber and a nice full fibered head. 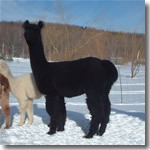 He (along with his sister Molly) took a blue ribbon in the Product of Dam class at the Coastal Classic Show in Maine in 2005. "Cyrus" is a very soft, mahogany dark brown boy. His fiber is both pleasing to the eye and touch. 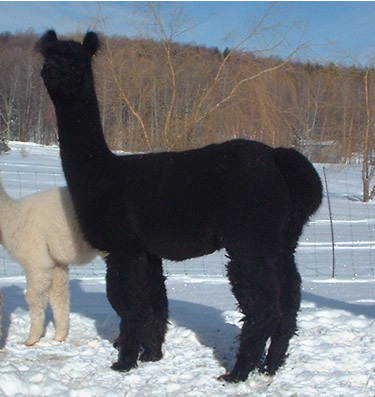 His mother is TB so there are some real color possibilities for his offspring. He's a favorite of visitors because of his friendly and gentle nature, not to mention his teddy-bear looks. 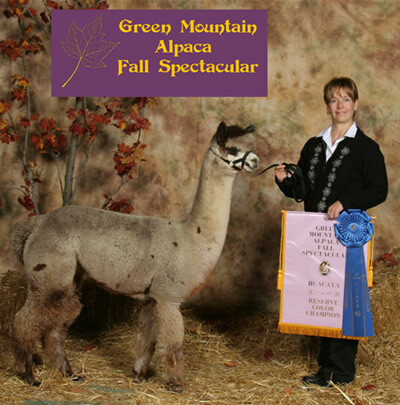 He took 5th place at the Coastal Classic Show in 2005 and in 2006 took a 4th place ribbon in his color class at the Green Mountain Alpaca Fall Spectacular in Vermont.